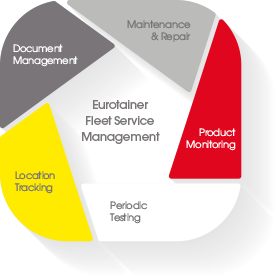 Eurotainer is pleased to announce the achievement of a significant milestone in their Fleet Service Management Programs. The company has delivered, since the start of their Fleet Service Management offering, a total of US$4 million in customer savings. This program continues a pattern of delivering value to our clients and has evolved to include our Eurotainer Global Shared document system and GPS tracking/monitoring services since its’ inception, adding additional benefits to our customers. Under the program clients outsource the maintenance and repair of their tank container fleets to Eurotainer. By utilizing the Fleet Service Management Program, those customers that have taken advantage of it have realized significant cost savings versus managing the maintenance of their fleet on their own. The Fleet Service Management Program is a value added service that that includes tank container testing & maintenance, GPS/cellular asset tracking technology, and telemetry systems for product monitoring. It leverages Eurotainer’s tank container maintenance & repair expertise and global buying power for parts, labor and services.